The M-Zero continues Avalon's tradition of cutting edge design and top quality performance in portable observing and Astro-imaging systems. Avalon Instruments introduces the M-Zero, an Equatorial-Altazimuth Single-Arm mount with Fast-Reverse technology. 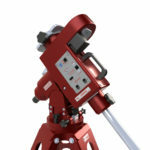 The new M-Zero single-arm mount by Avalon Instruments has been designed to revolutionize the world of portable astronomy with both the style and function that Avalon Instruments is known for. Made entirely from anodized aluminum with stainless steel hardware, the low weight and high quality of this mount make it the ideal companion for travelling observers and astro-photographers. a time-lapse platform for panoramic pictures. The great versatility and compact size combined with Avalon's unmistakable style, allows M-Zero to get you to a level where competition stops. With only 10 kg of total weight (including the brand new T-Pod 90) and 8 kg loading capacity the M-Zero fits in a medium-sized trolley for safe transportation while traveling. The combination of the brand new StarGo GoTo-System with several esclusive functions, the innovative Fast-Reverse technology (belt drive system) and the top-quality construction allows high level performances and autoguided long-exposure astrophotography without time limits - even with telescopes with focal length up to 2m,(8" SCT & 8" RC). The Avalon StarGo GoTo-System has been designed and manufactured by Avalon to meet all needs, from the beginner to the professional photographer. In Equatorial mode the M-Zero does a meridian flip and relatively long tubes can be used as well. It can also quickly be set in Altazimuth mode for observation with large telescopes and binoculars or to acquire automatic timelapse sequences. More about the AVALON StarGo GoTo Control System.